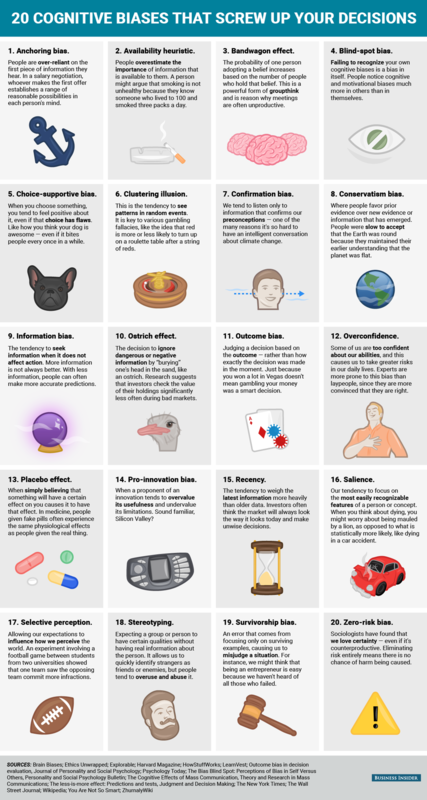 Are you familiar with cognitive biases? This infographic comes from Business Insider. Have you heard of any of these? Confirmation bias seems quite common. It can be hard to consider information that contradicts a strong belief – I speak from personal experience! Another one that I'm trying to be more aware of is my zero-risk bias. I strongly prefer certainty to uncertainty. It means that sometimes I avoid risk entirely, even if the risks involved are minor, like not giving a presentation because I'm nervous about audience questions I might be unable to answer.